It’s now been almost 18 months since we last saw Oxnard’s Mikey Garcia in a boxing ring, shutting out Juan Carlos Burgos back in January of last year. The long term contractual dispute with his promoter, Bob Arum’s Top Rank, shows no sign of abating, despite recent assertions from the fighter and his brother/trainer Robert that he had hoped to be back in the ring before the end of the year. For his part, Garcia believes the promotional contract he signed with the company expired following the Burgos fight, although Top Rank disagrees – and as a lawsuit grinds it’s way through the courts, Garcia is forced to wait out the terms of the old agreement. Recent talks between camps have come to nothing, and Garcia has spoken once again to fighthype, to assert his belief he is on the correct side of the dispute – and is prepared ‘to go the full 12 rounds’ with the firm. Yet the former 2 weight world champ remains positive in light of the inactivity, insisting the experience of learning new and interesting things, in and out of boxing, and being available for the fans is seeing him through, mentally. The wait goes on for Garcia, who at 27 is losing large chunks of prime. He has insisted he wishes to return at 140 lbs and Terence Crawford (also Top Rank) has gone on record to say he will happily oblige him, if only he wasn’t bound. 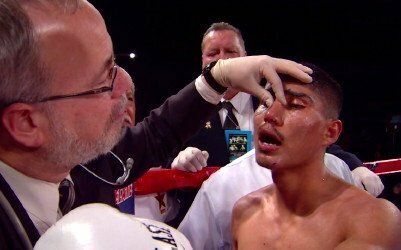 Garcia remains firm that he wants to be released from Top Rank or to sign a new, improved, agreement. Luckily for Mikey, his last purse alone, for the Burgos fight, was a reported $750,000.